Synthesized peptide derived from the C-terminal region of human HGFA. Small volumes of anti-HGFA antibody vial(s) may occasionally become entrapped in the seal of the product vial during shipment and storage. If necessary, briefly centrifuge the vial on a tabletop centrifuge to dislodge any liquid in the container`s cap. Certain products may require to ship with dry ice and additional dry ice fee may apply. This gene encodes a member of the peptidase S1 protein family. The encoded protein is first synthesized as an inactive single-chain precursor before being activated to a heterodimeric form by endoproteolytic processing. It acts as serine protease that converts hepatocyte growth factor to the active form. Alternative splicing results in multiple transcript variants. 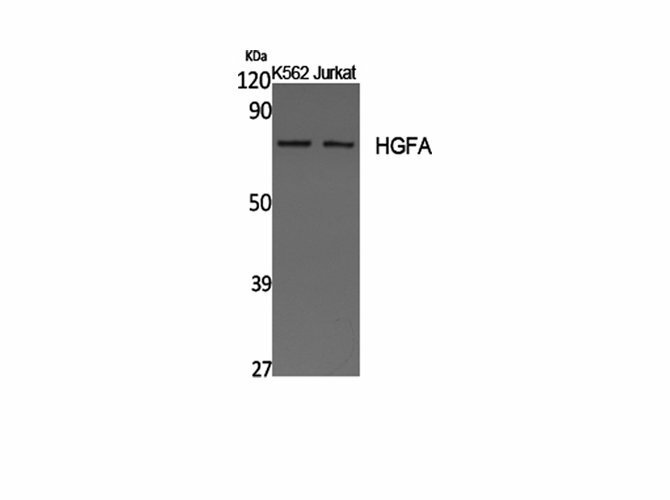 Western Blot analysis of K562, Jurkat cells with HGFA Polyclonal Antibody. NCBI/Uniprot data below describe general gene information for HGFA. It may not necessarily be applicable to this product. HGFAC: Activates hepatocyte growth factor (HGF) by converting it from a single chain to a heterodimeric form. Belongs to the peptidase S1 family.